IBM just got the results in on yet another of its boundless surveys, this one concerning my favorite, the marketing industry. Click to enlarge. While new social media and mobile devices are vital, the recent IBM “State of Marketing” survey revealed that 41 percent say keeping pace with the growth of these channels and device choices will be their biggest challenge over the next three to five years. This finding follows IBM’s 2011 CMO study where 65 percent of CMOs stated that they are under prepared for the growth of social and online channels such as Facebook and Twitter and new device choices including smart phones and tablets. The lead: CMOs and CIOs must partner to connect with today’s elusive consumer across new channels (including mobile and social). Sounds obvious enough, but fully 60 percent of marketers point to their lack of alignment with the company’s IT department as the biggest obstacle to reaching today’s consumers. On the mobile front: Mobile marketing seems to be working well, according to the findings, but marketers are preparing to move beyond coupons and deliver mobile advertising that reaches customers on smartphones and tablets. 34 percent of respondents stated that in less than 12 months, they intend to deliver mobile ads, the highest rate of new marketing tactic adoption in the five-year history of the study. Overall, 46 percent of respondents are currently using mobile web sites followed by 45 percent mobile applications, up from 40 percent and 44 percent respectively since last year. While the mobile channel is thriving, marketers lack this same clear consensus on how to best utilize social media, which will result in ongoing experimentation with these channels. When looking toward the remainder of the year, 26 percent intend to launch applications on 3rd party social network sites, 24 percent plan to incorporate user-generated content into their social media efforts, and 23 percent are looking to launch social media ads or share links in email and web offers. Dipping their toes in the water, checking things out, but not necessarily diving in. IBM digital marketing consultant Todd “Turbo” Watson provides his own response and recommendations concerning the results from IBM’s 2012 “State of Marketing” study. This IBM “State of Marketing 2012” study surveyed more than 350 marketing professionals across a wide range of industries and geographies. Notably in the study, 51 percent of respondents who identified their companies as high-performing indicated they have good relationships between marketing and IT, 10 percent higher than other companies. This figure validates the importance of the marketing and IT alliance which gives top performers greater responsibilities for the products and services, price, place and promotion (the 4Ps), and communication across the purchasing cycle. As a result, marketers from these higher performing companies are nearly three times more likely to be pro-active leaders in driving their organization’s customer experience across all channels. “This research indicates that as new channels continue to mature and consumer habits evolve, marketing and IT have no alternative but to emerge from their traditional silos and form a strong partnership that puts the business in a position to succeed,” said Yuchun Lee, Vice President, IBM Enterprise Marketing Management Group. Marketing and IT Lack Integration: While 48 percent of respondents believe that improved technology infrastructure or software will enable them to do more, nearly 60 percent indicated that lack of IT alignment and integration are significant barriers to the adoption of technology. This void further reinforces the notion that CMOs and CIOs must forge stronger, more aligned relationships that put the business in a position to succeed. Marketing and IT Lack Unified Vision: While 71 percent believe integration across owned, earned and paid channels is important, only 29 percent are effectively integrating these different channels. When asked why, 59 percent said that existing systems are too disparate to integrate these channels. This is most evident in areas such as mobile and social where only 21 percent and 22 percent of respondents run these tactics as part of integrated campaigns with the remainder conducting them in silos, discretely and on an ad hoc basis, a practice which inhibits their ability to deliver effective cross-channel campaigns. 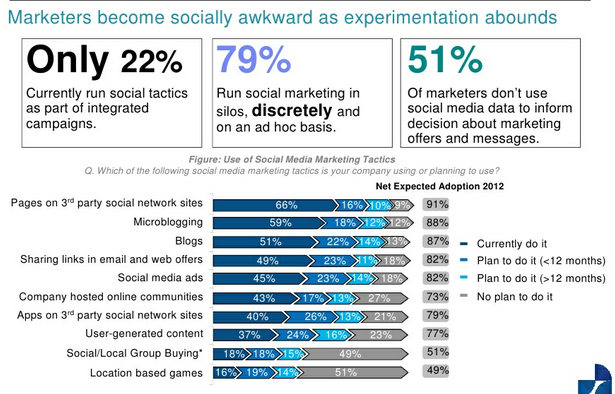 Marketers State Social and Mobile are Biggest Challenges Moving Forward. While new social media and mobile devices are vital, 41 percent stated that keeping pace with the growth of these channels and device choices will be their biggest challenge over the next three to five years. This finding follows IBMs 2011 CMO study where 65 percent of CMOs stated that they are under prepared for the growth of social and online channels such as Facebook and Twitter and new device choices including smart phones and tablets. Marketers Ignore Social Media Insights: While marketers continue to experiment with social media channels, 51 percent are not using this data to inform decisions about marketing offers and messages. This may represent a missed opportunity for marketers looking to best meet the needs of today’s customer. Marketers Fail to Turn Data into Action. When asked how they are using online visitor data, 65 percent of respondents are doing the basics, reporting and analyzing their data. Despite that number, only one third are using this data to target one-to-one offers or messages in digital channels and less than 20 percent are using this online data to make one-to-one offers in traditional channels. So, what’s a poor, social-media starved, completely unintegrated, IT-deficient CMO to do? Lead with the customer experience. Collaborate with your other business functions and work to expand the role of marketing throughout the purchasing cycle. Make marketing everybody’s job (because they should all have a stake in its outcome), and use business analytics with agreed on core KPIs that helps convey to everyone your progress (or lack thereof). Break Down Those Walls…And Silos. Think about your customer experience from their perspective, map your engagement with them, and then figure out where the gaps and inconsistencies are. You can have the best TV ads in the world, but if your customer service rep hasn’t been enabled to address that wonderful Facebook campaign you were running, no amount of apologizing can make up for such basic gaps and gaffes. Embrace a tech marketing platform. Use technology to your advantage. Stop practicing the art of southern engineering (using chewing game and baling wire to build your campaign). Partner with IT to more aggressively eliminate silos and integrate and bring on board those new technologies that will help you automate your marketing. In the process, learn how to speak to your CFO in their terms, and be increasingly prepared to explain the value of your marketing in (numerical) terms they can appreciate. You can download the full study results on SlideShare. « IBM And Wimbledon: Real-Time Tennis Analytics, Anyone? Reblogged this on Mirv in the 'Burgh.